It was really funny, people around my parts of the country were complaining that it was so cold in May, then once June hit, BAM, the heat hit but so did the humidity. 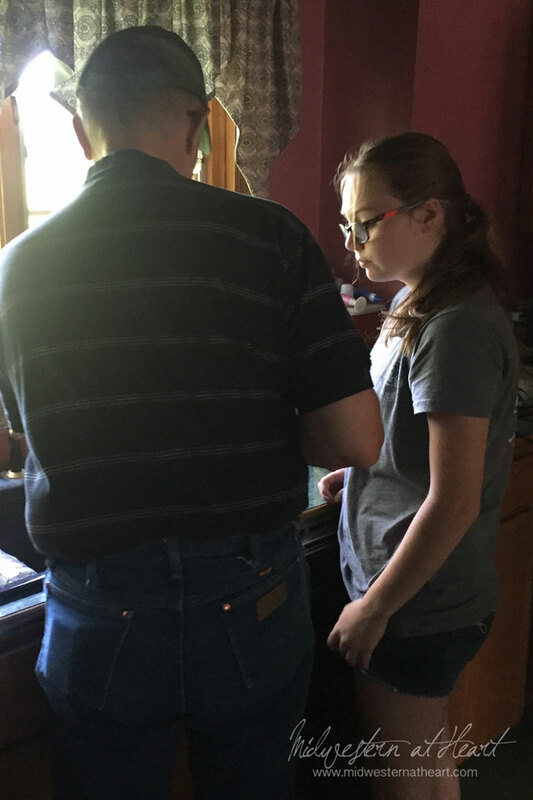 And it is hard for some people to imagine the midwest having humidity since we’re not surrounded by water, but there are days that you can walk out and be ringing wet because of the humidity. So one thing we have to deal with is molding saddles in our trailer. 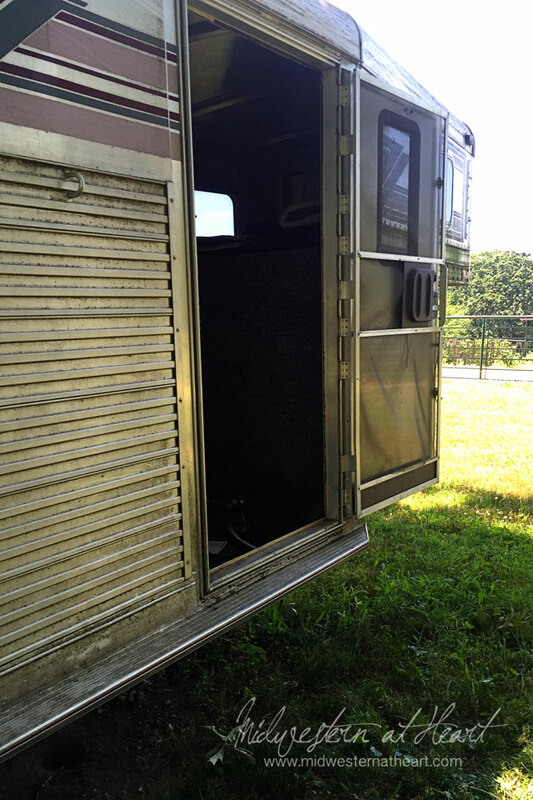 The changing area in the trailer doesn’t get a lot of air movement so when the saddles/bridles hang out in the nose of the trailer, they sometimes mildew. Yuck! 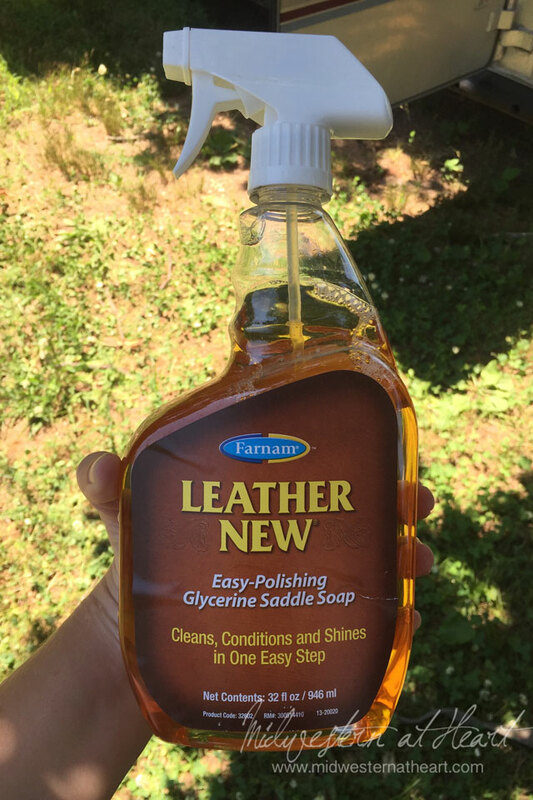 So here’s a trick to help you keep your leather tack in tip top condition! 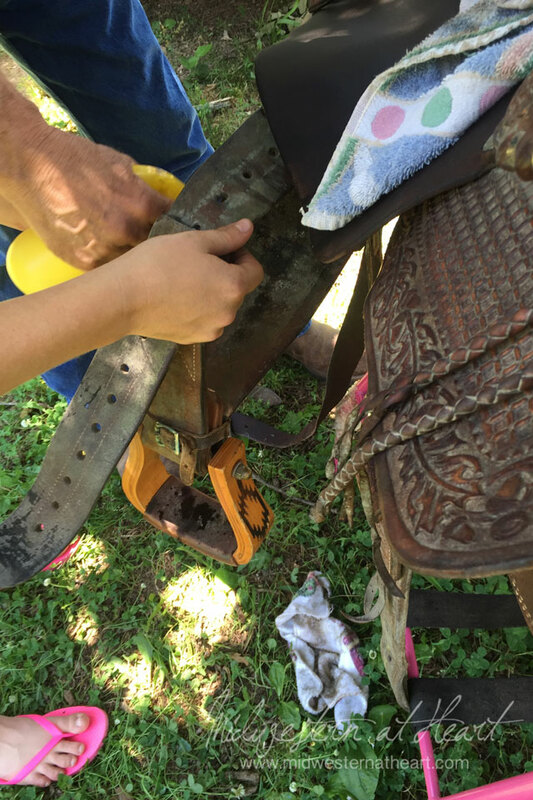 On Father’s Day, Dad and Tbug worked on cleaning up the saddles and bridles that decided to grow some mildew. Are you scratching your head yet? Listerine? Really? Yup! 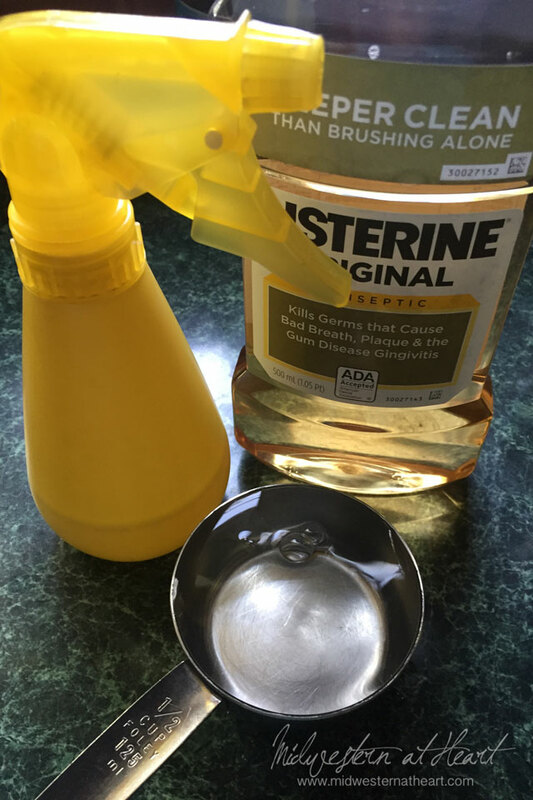 So you do 2 parts water to 1 part Listerine, place in your spray bottle, shake up and you’re ready to go. It helps kill the mildew and keep it at bay. And I’m not sure there is much that brown kind is good for… lol. 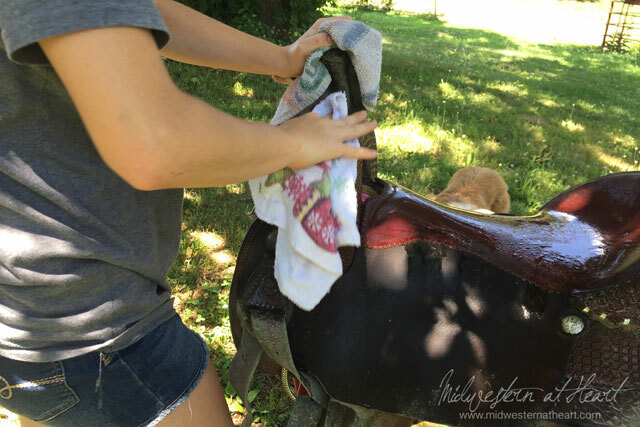 So cover your saddle with the Listerine mixture. Be sure to get even the underneath side. Cover the saddle with this mixture. Then take a rag and scrub scrub scrub. 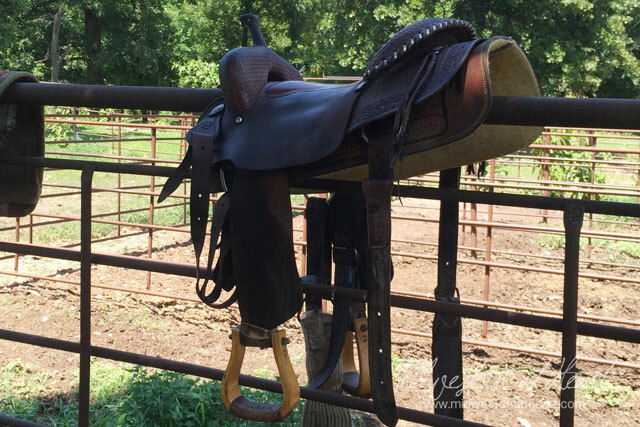 Once you’ve done that, condition your saddle. It’s always good to condition your saddle anyway. This is leather soap. 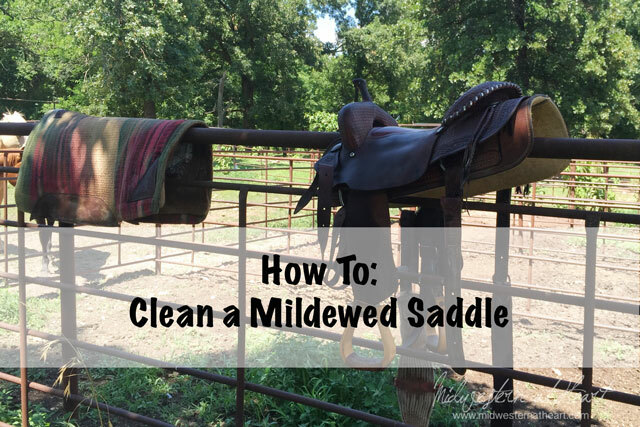 It works the same way, spray it on, rub it off with a towel, and bam, you have a clean saddle. 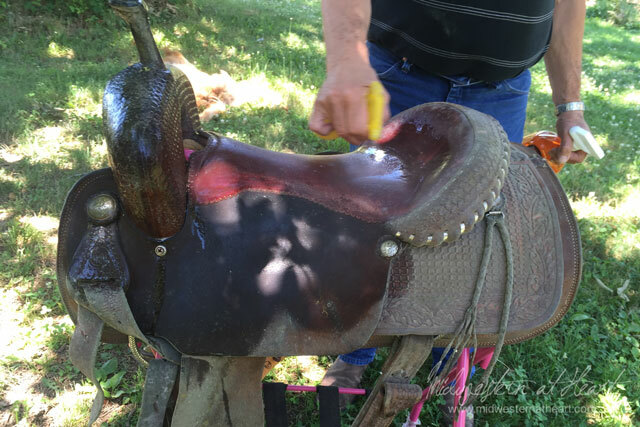 Then just let your saddle dry. Now in the humidity, that is easier said that done sometimes, but that’s all it takes. and one last piece of information… Do you know Why Emeril Lagasse yells BAM? Supposedly it was to keep the audience awake. :). I have no idea how true that is, just what I heard and when I said BAM I thought I should share :). Happy Monday!